Spring is finally here! It has been a long winter and we are ready for longer days and warmer nights. Windows are open. Fresh breezes waft through the home. The air is full of renewal and new chances. Also, spring brings new opportunity for you and your home. It’s time to pack up those heavy winter blankets. Clear out your winter decorations. Wash or dry clean your winter items and pack them away till next winter. Winter leads to hibernating. We like to hibernate with all of our stuff. Clear through those piles of old mail. Go through your closet and donate the items that are no longer used. Now is the perfect time to get rid of those items that no longer have lids, or the one sock without a partner. Recycle mismatched containers and give away those dishes residing in the back of your cabinet. Bringing more space will breathe fresh air into your home and allow you to relax. Dry goods and packaged items last a long time. Think about donating to your local food bank or shelter. Now is also a good time to plan for fresher, whole foods. Clean out your fridge and throw away any expired or old items. Looking for bigger upgrades? Spring is the perfect time to renovate your home. Winter can cause unforeseen delays due to weather and cold. As winter wraps up, Spring brings warmer weather and less delays. Also, the warmer weather provides a better environment for building. The kitchen is the heart of the home. Family gathers in this room and brings everybody together. 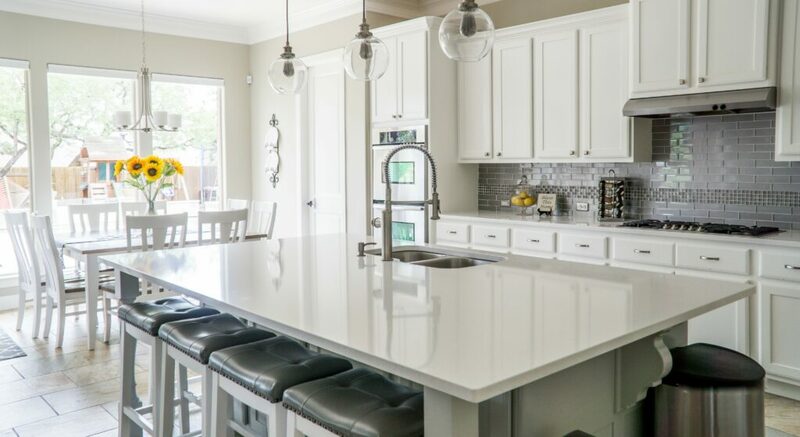 New appliances, cabinets and countertops breath new life into the home. Simplifying layouts or adding the dream island can bring a modern feel to your home. You can even remove that bulky wall creating fresh lines and open views throughout your house. Splurge for a luxurious shower o soaker tub. Bring in new counter tops. Upgrade with bright colors and prints. You deserve a spa bathroom as your relaxing oasis. Life is stressful and your bathroom should be a luxurious getaway. Old carpet traps dirt and can weigh down your room. Fresh, new flooring brings a lighter feel to any room. Hardwood flooring is a classic option that adds value to any home. Luxurious vinyl planks bring elegance while being cost saving. Multiple flooring options exists that update any room. New tiling brings a fresh feel to your bathroom and kitchen. Harsh weather, and natural wear and tear, can ruin any outdoor space. Pick the weeds and plant fresh flowers. Also, now is a perfect time to upgrade your driveway, increasing your curb appeal. Adding a new deck is a perfect way to expand your living space. BBQs and family game time are wonderful ways to create memories with your brood outdoors. Winter can be a mess for home addition projects. Spring is the perfect time to reassess your spacing needs. Home additions create more living space by adding a bedroom, a much-needed additional bathroom, or larger kitchens and living rooms. Spring renovations are the perfect way to update your home. But are you looking for improvements on a smaller scale? Upgrade your home with these small tweaks. Heavy curtains are an excellent way to conserve energy and eliminate drafts. But Winter is over. Open up your windows with light window treatments. Utilize gauzy curtains in pastel colors to brighten your space, while maintaining your privacy. Whether your view is a gorgeous horizon or your front parking space, opening your windows is a great way to create more open lines, bring in fresh light, and decrease stress for your whole family. Dry clean your heavy-duty comforters. Pack them away for the next cold snap and get ready for warmer days. Cool greys and relaxing pastels bring a sense of calm and relaxation into your bedroom. Your bedroom should be a relaxing, safe space from daily stress. Newer LEDs or halogen light sources naturally generate a warmth throughout your property. Be sure to install a dimmer switch with your new lighting solution; it’s the best way to ensure your lights provide exactly the right ambiance. Fairy lights can add a touch of whimsy to any outdoor space. Vernon Esham Builders works with you from beginning to end to ensure your new or renovated home is perfect. To discuss further and learn about more renovations, call us at 443-783-5792 or email us at vernon@vernoneshambuilders.com.